HERE’S YOUR CHANCE TO SHARE YOUR 911 PREMONITION STORY! On 11 September 2016, the 15th anniversary of the 9-11 attack, I will release a very personal, mostly autobiographical new eBook (that will later be published as a printed book as well). It will contain the story of my evolution of premonitions about the 9-11 attacks documented in articles and books on Nostradamus’ prophecies starting in 1983 and climaxing just the day before the attacks. It will also chronicle the history of other examples of famous documented mass premonitions of future events climaxing with those about 9-11. That book will be published as an eBook on 11th September on Amazon and other ebook distributors, but if you wait a bit longer, you can receive the special expanded edition for donors only and your premonition story may be included in the appendix that the mainstream edition will not possess. 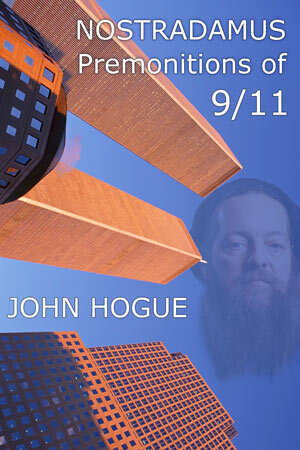 Nostradamus: Premonitions of 9-11 (The Expanded Donors Edition) will be released in October 2016 as a PDF file eBook, personally downloaded to those who help Hogueprophecy continue to thrive by donating $12.50 or a little more HERE. When you donate, please put 911 in the memo line on the Paypal page. If you don’t see the memo line just send me an email at hoguebulletin@hogueprophecy.com and put 911 in the subject line. We prefer Gmail for best delivery. Do not use Mindspring, Explorer, Cox or Earthlink. Remember, only Hogueprophecy readers who donate $12.50 (premonition writers included) will be reading this gift edition, so please contribute. We need the gift of your financial support and we’d love to publish your story as part of our PDF gift edition eBook we will personally download to donating members of our dedicated Hogue reader community this September. Many of you have already sent your stories since September 2001 and I will contact you for permission to use them. For those who have yet to send your stories, please keep them as concise as you can. Short as possible is preferred. Limit your story to 1,000 words or less and we encourage less. Not all accounts will get into this book but those of you who make an effort to write well and send me polished, spell checked, punctuated and grammatically competent premonition accounts have the best chance of seeing your account in the new eBook. Please send your stories with the subject line–9-11 Quote–to hoguebulletin@hogueprophecy.com.